Take a look at what President Donald Trump’s decision to end DACA means for Texas. 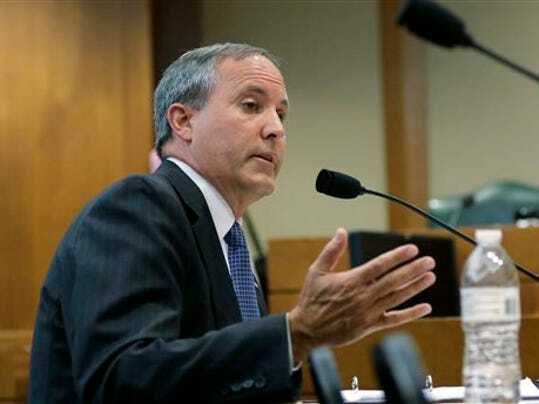 AUSTIN — Texas Attorney General Ken Paxton filed a lawsuit against the federal government on Tuesday, looking to end the Deferred Action for Childhood Arrivals program. Paxton threatened to sue the government early last year if the Trump administration did not take steps to end the program. President Donald Trump started to phase out DACA in September, but multiple federal court decisions have forced the government to allow some aspects of the program to continue. In his 137-page lawsuit, Paxton argues that President Barack Obama did not have the authority to establish the program through an executive action in 2012, as he did. When Trump ended DACA in September, he prompted a flurry of lawsuits from supporters of the program looking to protect the more than 800,000 people who have received permits through the program since its inception. Two federal courts, one in California and the other in New York, have since issued rulings stating that the federal government must allow DACA recipients to apply for renewal while legal challenges to the program play out in court. No new applications are being accepted. Texas’ lawsuit says that, although the court “has authority to immediately rescind and cancel all DACA permits currently in existence because they are unlawful,” the states on the suit are only asking for the federal government to stop issuing new permits or renewing existing ones. Texas Democratic Party Chair Gilberto Hinojosa said Paxton’s “cruel anti-immigration agenda” will put the state’s economy in jeopardy, as nearly 125,000 people in Texas rely on DACA. “Instead of wasting taxpayer funds to pick on these Americans without status, the Attorney General should join the bipartisan chorus calling on Congress to fix a broken immigration system that denies these kids their rightful place at the American table,” said Anchia, D-Dallas, in a statement.